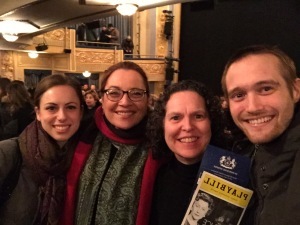 Royal Oak staff saw Helen Mirren in The Audience this Sunday on Broadway. Peter Morgan’s play is a captivating look at Queen Elizabeth’s life, spanning from Buckingham Palace to her country house, Balmoral, and historical eras, from Churchill to Cameron. When Eddie Redmayne scooped up his Oscar last Sunday, winning Best Actor for his portrayal of Stephen Hawking in The Theory of Everything, it felt like a coronation for a new generation of British film royalty. That evening, 40 Brits were nominated in 20 different categories, including five – Felicity Jones, Rosamund Pike, Julianne Moore, Benedict Cumberbatch and Redmayne – for their leading roles. 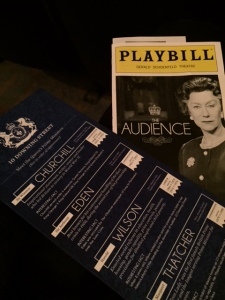 But if the Oscars were a coronation of the coming generation of British stage talent, this Sunday served as a reminder of the force of our current icons – and actual royalty – as Royal Oak staff went to see Helen Mirren as Queen Elizabeth II in The Audience thanks to the generosity of one of our board members. 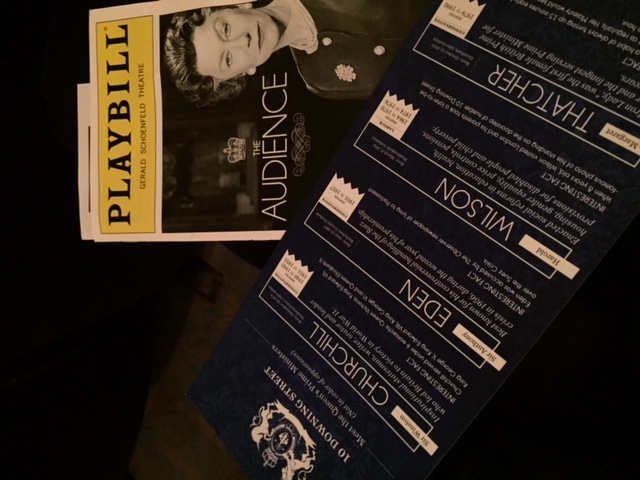 The Playbill and a helpful guide of the Queen’s PMs. What could have been a disarming leap between all these political titans was made seamless by a strong performance from Mirren. There’s a moment in the play when the Queen explains to a younger version of herself that her job is to be a constant to all these complicated, political beings. She seeks to give them “something constant, unchanging, against which to measure themselves.” While Mirren herself displayed dynamism in her role, her constant presence on-stage had a soothing effect, giving the audience a hook to grab onto as we swung between decades. What’s particularly impressive is the way Mirren explores how the personal and political are inherently linked. While the play centers on political events, Mirren distills them to the personal stakes, imbuing her Queen with vulnerable dignity. When facing off with Thatcher over sanctions against Apartheid South Africa, she reveals the Queen’s interests to be informed by morality but driven primarily by friendships with leaders throughout Africa. And when Harold Wilson visits her in the Scottish country home Balmoral, the warm relationship – and not political divisions — informs all. By bringing this personal aspect to an examination recent political history, Mirren nuances the discussion. We in the audience are reminded that the political issues that face us and our leaders today are not abstract, but extraordinarily personal. Don’t miss out on another examination of the personal life of one of recent British history’s key figures. Join us for “Young Titan: The Making of Winston Churchill,” a talk by Michael Shelden as part of our Drue Heinz Lecture Series.